Who said safety posters have to be boring? Johns Hopkins University’s new lab safety poster design, reminiscent of rock ’n’ roll concert posters from the 1960s and 70s, proves otherwise. 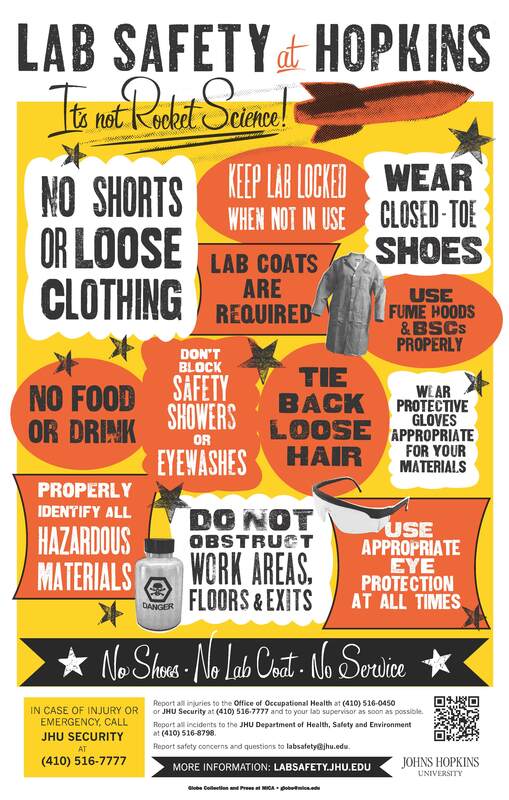 Safety is stepping out in style at Johns Hopkins University, all thanks to a new, eye-catching lab safety poster design that encourages students to wear appropriate PPE, follow safety procedures and properly identify hazardous materials. Johns Hopkins University and the Maryland Institute College of Art (MICA) teamed up to produce a lab safety poster in the style made famous by Globe Poster Printing Corp., the defunct Baltimore poster company that produced colorful concert advertisements in the 1960s and 1970s for musical greats including James Brown, Etta James, B.B. King and Otis Redding and more. No shorts or loose clothing. Use fume hoods and BSCs properly. Properly identify all hazardous materials. Do not obstruct work areas, floors or exits. Use appropriate eye protection at all times. Wear protective gloves appropriate for your materials. Don’t block safety showers or eyewashes. Keep lab locked when not in use. The posters will appear in labs for both the Krieger School of Art and Sciences and the Whiting School of Engineering on the Homewood campus beginning this fall, and will feature the bold wood type and bright backgrounds that once enticed followers of the Godfather of Soul and Aretha Franklin to concerts up and down the East Coast. After the Cicero family closed Globe in 2010, MICA acquired many of the company’s assets, creating the Globe Collection and Press at MICA. MICA is the new home for the tools used to create the vivid posters, such as more than 100,000 pieces of wood type and boxes of hand-carved illustrations and photo cuts of the many musicians who appeared on Globe posters.